Rev. Dr. Dinku Bato has accepted the call to the Lutheran Heritage Foundation (LHF) to serve as coordinator of LHF’s African translation projects. Rev. Bato’s installation service will take place at Jehovah Lutheran Church in St. Paul, Minn. on Sunday, March 25 at the end of their 11:30 a.m. Ethiopian-outreach service. Rev. Bato was born in Ethiopia and raised in Mekane Yesus, a Lutheran church body in Ethiopia with over 8 million members, where he was a campus pastor. He and his family relocated to the United States about 6 years ago to continue his theological studies, and Rev. Bato colloquized into the LCMS in June 2017. Rev. Bato’s commitment to the traditional Lutheran understanding of Scripture dovetails perfectly with the LHF mission of translating and publishing books like Luther’s Small Catechism and the Book of Concord into the languages of the world. Another important role Rev. 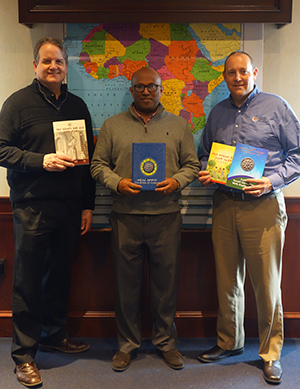 Bato will fill at LHF is helping to make connections with the 2 million African immigrants in the United States and finding new ways to share LHF books with them. The public is invited to attend Rev. Bato’s installation service at Jehovah Lutheran Church, 1566 Thomas Ave., St. Paul, MN 55104. LCMS clergy are invited to vest (red stole) and participate in the rite of installation. A light dinner featuring Ethiopian dishes will follow the service. Rev. Bato is a 1997 graduate of Mekane Yesus Seminary in Addis Ababa, Ethiopia. He received his master’s degree in anthropology from Addis Ababa University in 2003 and his doctorate in Congregational Mission and Leadership from Luther Seminary in Minnesota in 2015. He is married to Mergitu Sarka; they and their three children reside near St. Paul, Minn. The Lutheran Heritage Foundation is a recognized service organization of The Lutheran Church – Missouri Synod. For over 25 years, LHF’s mission has been to translate, publish, distribute and introduce Lutheran materials that are Bible-based, Christ-centered and Reformation-driven. LHF has published books like Luther’s Small Catechism, A Child’s Garden of Bible Stories and the Book of Concord into more than 100 languages.